Grace Kelly’s engagement ring is legendary – not just for its beauty, but for the incredible love story behind it. The platinum Cartier ring features an emerald-cut center diamond weighing in at more than ten carats. Flanked by a pair of baguette-cut diamonds for an overall look of sophisticated enchantment, this celebrity engagement ring reflects Grace Kelly’s sophisticated style perfectly. So, what’s the story behind Grace Kelly’s engagement ring? It all started back in 1955 when Kelly headed the U.S. delegation at Cannes Film Festival. As part of the festivities, she was invited to take part in a photo session held at the Palace of Monaco. Though she was dating French actor Jean-Pierre Aumont at the time, she was thrilled to meet Prince Rainier III. In December of that same year, the prince made a trip to the U.S. He again met Grace Kelly, and this time, he met her family as well. After three days, he made a proposal, which she accepted. The civil ceremony took place on April 18th of 1956, and the religious wedding happened the following day at Monaco’s Saint Nicholas Cathedral. It was watched by an estimated 30 million television viewers. Like Grace Kelly’s engagement ring, this three-stone ring from Brilliance features a stunning emerald-cut diamond flanked by smaller side stones. 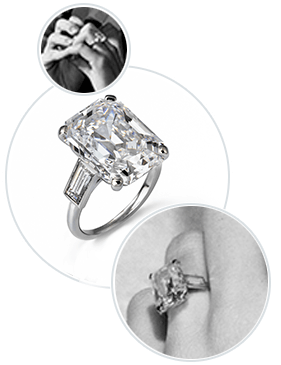 While it is smaller than Princess Grace’s ten-carat sparkler, it features a clean, classic design that pairs well with anything you choose to wear. Born in Philadelphia on November 12, 1929, Grace Kelly came from an affluent family of half German and half Irish descent. Her father was Olympic gold medalist John B. Kelly, Sr.; he is also famous for founding a popular East Coast brickwork contracting company and for serving as President Roosevelt’s National Director of Physical Fitness during WWII. As Grace’s mother, Margaret, was a physical education teacher at the University of Pennsylvania as well as a model and beauty queen, Grace and her siblings received a great foundation that encouraged them to lead healthy lives. During her youth, Grace modeled fashions with her sisters and mother, gaining a taste for the spotlight in the process. She made her acting debut at age twelve when she played the lead in a school play called Don’t Feed the Animals. Soon, she was acting and dancing, hoping to follow in the footsteps of her favorite actress, Ingrid Bergman. Though her parents disapproved mightily, Grace Kelly pursued her acting dreams relentlessly, working as a model to pay her way through New York’s American Academy of Dramatic Arts. Her early roles were stage productions, but these were soon supplemented by parts written for television. Grace’s aptitude for TV soon led to her film debut, though she continued to take parts developed for stage and TV while working toward her goal of becoming a famous film star. Eventually, her hard work paid off, and her movies remain popular to this day. Did you know that once Grace Kelly married Prince Rainier, she was no longer allowed to act? As an important head of state, she spent the remainder of her years focusing on philanthropic work. She founded AMADE Mondiale, which is a Monaco-based nonprofit organization that focuses on improving the lives of children worldwide, and she also formed the Princess Grace Foundation in support of local artisans. These are just two examples of her many philanthropic contributions. What Our Experts Have to Say about Grace Kelly’s Engagement Ring. Grace Kelly’s engagement ring is the embodiment of Cartier’s signature style. Not only is the 10.47-carat center diamond a truly impressive one, its cut is beautifully elegant, with long, sophisticated planes that seem to go on forever. The simple platinum setting and side baguettes allow the diamond’s gleam to take center stage, just as Grace Kelly herself did. Celebrity engagement rings, royal engagement rings, and large diamonds from famous Hollywood jewelry designers are almost always pricey. In the event your own budget isn’t quite up to the cost of a diamond fit for a princess, consider choosing an equally stunning but more affordable design from Brilliance, where you can select a pre-set model or enjoy the process of creating your own custom engagement ring. By working with the experts at Brilliance, you can enjoy the sophisticated look you long for at a price that appeals to your bank account. No matter which you choose, you’ll enjoy the compliments you receive as well as the everlasting sparkle it brings to your daily life.